On Monday, I wrote about the diamond mine located in Mirny, a city in the Sakha Republic in the Russian Far East (RFE). This area of North Asia is full of resources like oil, gas, and minerals, but only has about 6.3 million people spread out across its entire area. More than half of the population is concentrated in Primorsky Krai and Khabarovsk Krai, on the Sea of Japan. The RFE plays an important role in the Arctic for several reasons. First, there is a long history of ties between certain indigenous peoples in the RFE and Alaska. The Yupik peoples, for instance, lived on both sides of the Bering Strait in Chukotka and Alaska, only to be separated for decades by the so-called “ice curtain” of the Cold War (explained more in a 1995 paper by Schweitzer and Golovko nicely entitled “Traveling Between Continents“). In terms of economics and transportation, the RFE is also important within the wider Arctic because its coastline forms the eastern half of the Northern Sea Route. Though the main rivers leading from inland eastern Siberia to the coast are often impassable, it is conceivable that the region’s natural resources could one day make it out to sea in significant amounts. The Kremlin is aware of the need to develop the transportation network. In 2012, Nikolai Patrushev, Secretary of the Russian Security Council, observed, “‘The state of the Urals, Siberia and Far East river transport is well below the demand from the region.” Given the requisite environmental conditions and infrastructure, Siberian resources could be shipped onward to Asia or Europe from ports such as Tiksi (Sakha), Pevek (Chukotka), and Dikson (Krasnoyarsk) – all key locations along the Arctic shipping lane. Maritime transport is much easier than land-based transport in this part of the world given the sheer lack of roads and railroads, especially in northeastern Siberia. 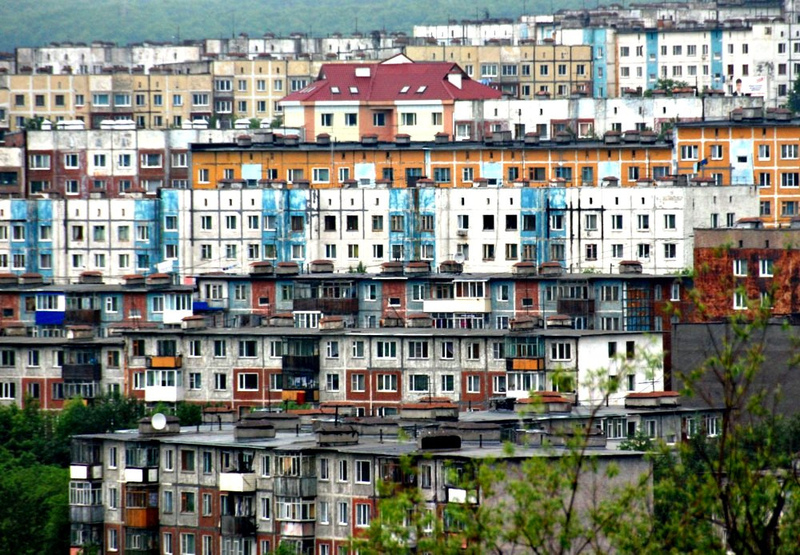 Additionally, there is the port of Vladivostok, the city of 600,000 people in Primorsky Krai in which the Japanese and Koreans have long held influence (although, as this Slate article from 2009 notes, “The most remarkable thing about Vladivostok is how thoroughly Russian it is”). My Russian tutor once told me that Vladivostok was the first city in Russia to receive Japanese cars. In fact, one of the city’s main industries is importing and reselling Japanese cars. Today, the Eastern Dream ferry sails from Vladivostok to Donghae, Korea and Sakaiminato, Japan. The picture painted by foreign trade, for instance, presents a much more complex story than one of a Chinese takeover. As visible in the map below, based on figures obtained from an excellent article on the RFE and China by Rens Lee posted by the Foreign Policy Research Institute, the four political entities within the RFE that border China – the Amur Oblast, the Jewish Autonomous Okrug, Khabarovsk Krai, and Primorsky Krai (Primorye) – all trade more with the Asian giant than any other country. Timber is one of the leading exports for all four of these places. Allegedly, much of this timber, which is in some cases illegally harvested, goes to Chinese furniture factories, which then re-export the secondary products to the U.S. and Europe. In return, all sorts of goods made in China, like electronics and clothes, are imported. Sakhalin and Kamchatka, astride the Sea of Okhotsk, trade more with South Korea than any other country. Sakhalin exports oil and gas south, while Kamchatka exports seafood. Chukotka, across the Bering Strait from Alaska, trades the most with the U.S. The trade balance is rather uneven, with Russia’s easternmost okrug importing construction materials, food, and machinery and exporting little in return. In all of these cases, then, trade ties seem to reflect geography – though surprisingly, Japan is not the top trade partner for any area within the RFE. What requires a bit more explanation are the top trade partners for the Sakha Republic and Magadan Oblast. As I explained in my previous post, Sakha’s main export is diamonds. Those diamonds are produced by the Russian state-owned company Alrosa, which in 2012 signed a supply deal with Belgium’s Laurelton Diamonds. A report from the Antwerp World Diamond Centre explains that in 2012, Russia supplied 20% of Antwerp’s imports of rough diamonds. 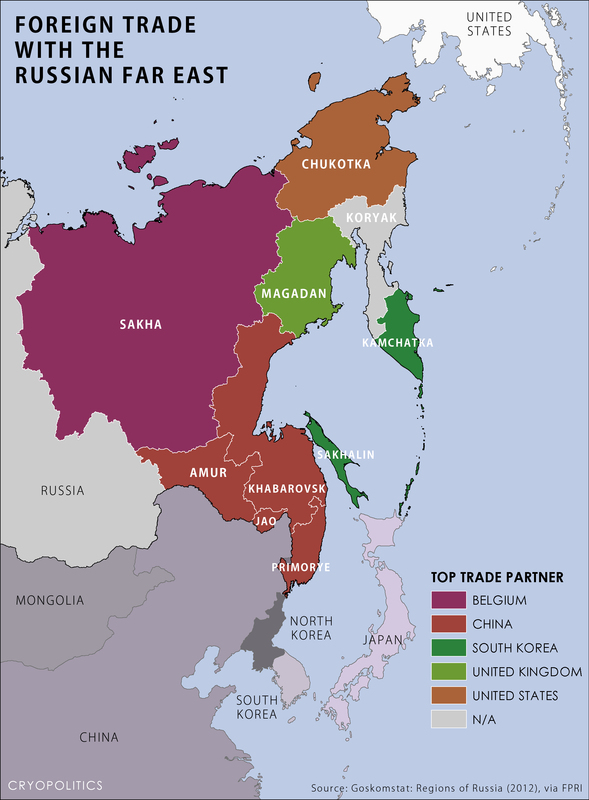 Since 99% of Russia’s diamonds come from Sakha, it’s basically Sakha that is supplying Belgium – and that exchange comes out in the map below, in which Belgium is shown to be Sakha’s most important trade partner. Magadan Oblast’s top trade partner is the United Kingdom. Russia Today called the oblast “Russia’s El Dorado” thanks to its wealth of gold deposits. While I can’t find any specifics about exports to the UK, Magadan’s main industries are mining and fishing, so it’s probably gold rather than seaweed and that is making its way to the British Isles. As Antwerp is for diamonds, London is the world’s gold trading hub. Singapore, however, announced this year that it seeks to become a gold trading hub. This could mean yet another Asian country will soon come knocking on the doors of the Russian Far East – but an invasion it is not.